EdCarlson.com – Video, television, film, and technology. Video, television, film, and technology. Here’s a nice trick I learned about when I was building an escape room. When using an Arduino to control LED tape, instead of building your own LED driver with MOSFETs, cheap LED amplifiers can be used. Here I stuck one to the back of an Arduino Nano for a super-compact driver. On a recent gig I was introduced to the Riedel Riface. 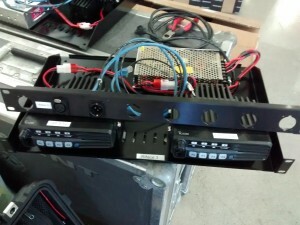 It’s a custom rack-mount chassis for two Motorola GM360 radios, so they can interface with an audio console, intercom system, or even themselves to use as a repeater. One of the other guys in the company figured he could build one for cheaper than the commercial version. It uses two Icom IC-F6011 base units. Getting audio out of the Icoms is easy, there’s a 3.5mm stereo jack on the back. Getting audio into the unit is more of challenge. ENG lenses are great. They have long zoom ranges, zoom motors, comfortable hand grips, and are more ergonomically friendly than other zoom lenses (especially still lenses.) So it’s no wonder people want to put this glass on their digital cinema cameras. The job: Build a two-part light-box wall 3 feet high by 15 feet long and 3 ft by 21 ft. The box’s panels must be interchangeable to accommodate different designs. The backlighting for the wall must be pixel-controllable for animated wipes and patterns. I visited Apex Elecgtronics for the first time after reading about them at Hack a Day. It’s like the junkyard version of All Electronics. Lots of broadcast equipment, metal pieces, wire (lots of wire,) components, test equipment, you name it. The secret of Apex is that you have to be willing to dig around to find stuff. I found a box of 150 1.3 volt 2 amp Ni-Cad batteries under another box of security cameras. In the aisle. Of shelves full of circuit boards. At one time there was probably some organization at this place, but as stuff kept getting added that organization fell apart. 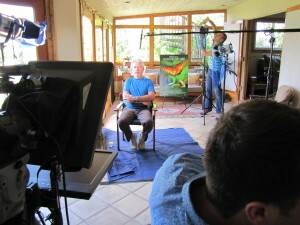 I recently had the opportunity to shoot VOD callouts for a new Disneynature documentary, “Wings of Life”. Director Louie Schwartzberg introduced the film for several VOD platforms, including Xfinity, FiOS, and TWC. He also did a quick interview with the folks from Disney’s D23 fan club. 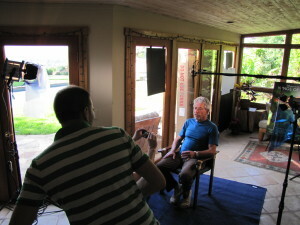 Here are a couple behind the scenes photos. We had a huge bank of windows to contend with. I only had a tungsten kit, so we gelled everything blue, except the backlight, which I kept tungsten to give a bit of color offset. The sun kept moving so our flags had to adjust as well. I could talk about all the things I wish I had for this shoot (HMI, 12×12 silk), but we worked around our limitations and came out with a great product. 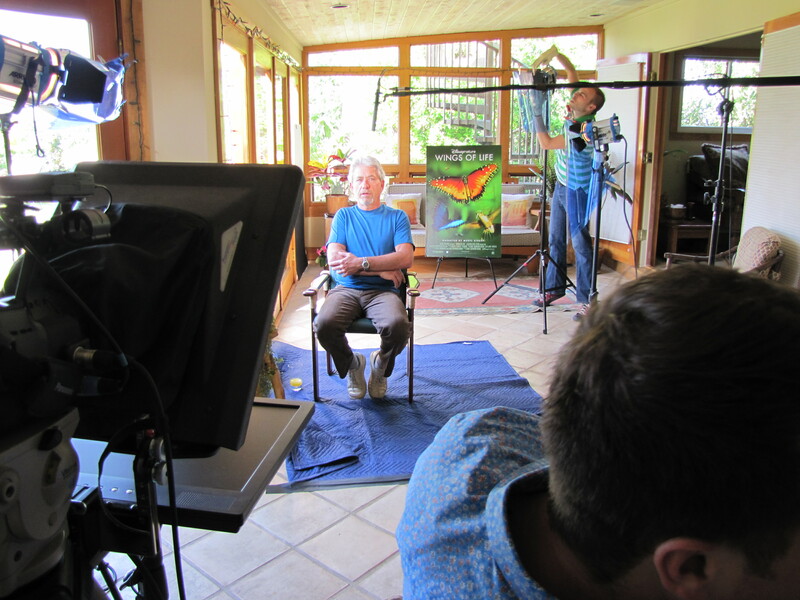 Look for Louie plugging “Wings of Life” on your cable or satellite VOD channel. I spent hundreds (if not thousands) of hours shooting for this video. The camp is in East Texas, near the border with Louisiana, which is quite a change from the Northeast climate I’m used to. The video came out wonderfully, better than I could have imagined. Yes, I could have had a better camera. Yes, I wish I had an assistant camera and an audio person. Yes, I wish there was air conditioning. But the experience and finished video were worth it. I lit a commercial in 2011 for the Hofstra Student Government Association’s fashion show, Destination Runway. 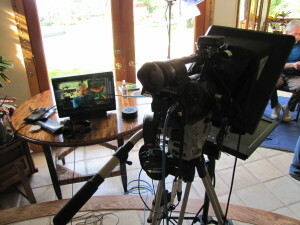 I also set up a camera up high on the lighting grid to take stills every few seconds. The camera is a Canon SX20IS with CHDK firmware and Ultimate Intervalometer. It’s mounted with a Mafer clamp and a Bogen magic arm. EdCarlson.com | Powered by Mantra & WordPress.